Mario Kart has returned on the 3DS with customizable karts and underwater levels. Somehow, Nintendo manages to keep adding new features to every single Mario Kart entry. 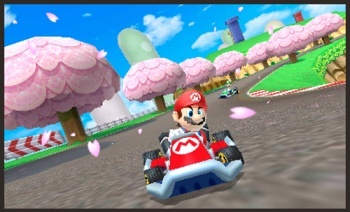 They've done it once again for the 3DS version of Mario Kart, made playable at E3 2011. Don't get me wrong, the game is still Mario Kart. You'll be trying to get a boost at the start line, picking up banana peels and shells with which to destroy your opponents, and power-sliding around curves for a speed boost. However, there are some notable new features Nintendo displayed in the demo version. Before a race, players can customize their karts instead of choosing different ones as in past titles. You'll choose the kart body, the kart wheels, and the type of hang-glider to add to the kart. The bodies are basically like the kart choices we've seen before, but wheels can make your kart into anything from a lowrider to monster truck. Wait, did I say hang-glider? Yes, yes I did. You'll be hang-gliding in Mario Kart 3DS whenever you launch into the air. Popping off of a jump in previous games sort of just made your kart fall to the ground. That descent is halted with the use of the new hang-glider. During races, players now collect coins again too. Surprisingly, in the middle of one level I drove into a lake and wasn't immediately fished out by Lakitu. Players will actually race underwater this time as if they were above water. It's mostly a visual effect for now. The game looked a little better than the DS version, and I felt 3D worked well while racing. Mario Kart 3DS will be available in Holiday 2011.